A chopsocky tale of two halves. The first hour sees a laughing monk (Mark Long) recruit a traveling band of wastrels (a brother and sister duo; two annoying cooks; a fat guy with a cart) to join him in creating a self-sufficient Buddhist commune in the shadow of the Shaolin temple. 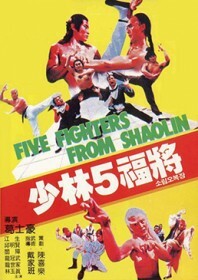 The film picks up once the ensemble develop their kung fu skills. Chen Shan becomes star pupil, gymnast Yau Ming-yin works out on a pommel horse, and Lin Yu-zhen, being the only girl, is left to do all the house work. Then a white-haired Jack Long drops in about 30 minutes from the end playing a disgruntled black magic fighter in a red cape demanding to know the whereabouts of a coveted Shaolin manuscript, and the film goes bananas. The swords come out and heads explode in a bonkers finale. It’s worth sticking around for.